Mrs. Finley requested I record my presentation as a video, in case students wanted to review some of the steps we discussed, so I recorded myself using an iPad and a tripod (with a $10 iPow iPad mount), and uploaded it to YouTube afterward. The audio quality isn’t fantastic since I wasn’t standing right beside the iPad, but hopefully it’s adequate. 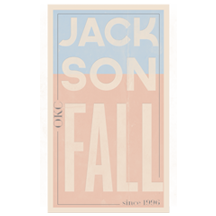 This is the 8th year of this wonderful book writing project for Mrs. Finley and her students, and my second year to help facilitate with some technology tools and strategies. 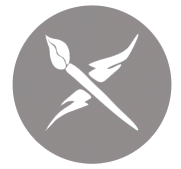 All the student book projects from last year are available on bit.ly/spr18ebooks, and this year’s student book projects are available on bit.ly/spr19ebooks. Those shortened links will redirect your web browser to Google Docs which include the covers, titles, and downloadable ePUB versions of student eBooks, as well as Lulu.com print version order pages. On an iPad, the easiest way to download the books directly is to click the Google Drive folder link, and then choose to open the desired ePUB file in the Apple Books app. 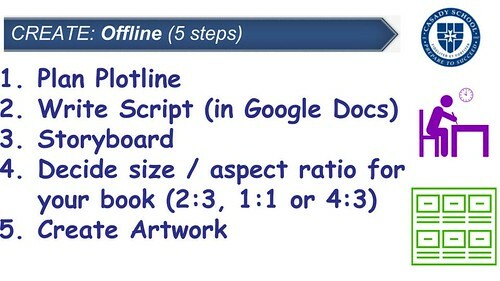 These are the five steps for writing or “creating” the book, primarily “offline” but possibly using Google Docs. 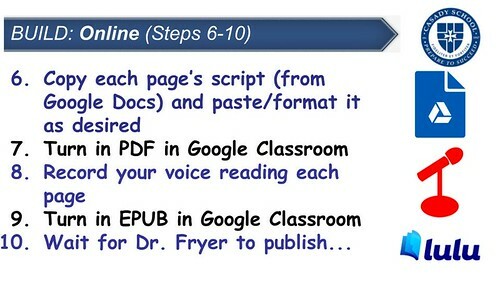 This year, I took the PDF versions of completed student books from the Book Creator website, and altered the margins of the book so it would be accepted for print publishing on Lulu.com. That was a mistake, however, because the formatting of the directly downloaded PDF from app.bookcreator.com is smaller and of a poorer quality than an exported PDF from the iPad version of Book Creator. 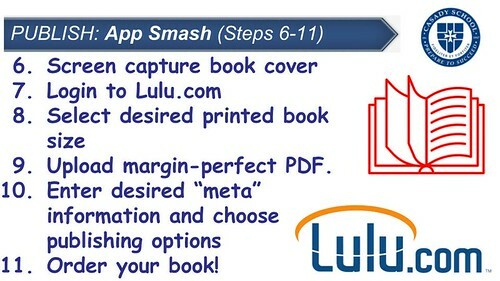 I shared this during my presentation today, and demonstrated the 11 steps of taking a finished ePUB file from Book Creator and publishing it successfully via Lulu.com. 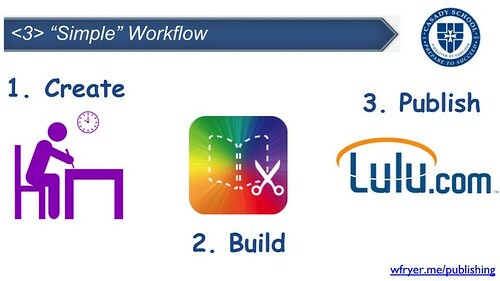 The initial steps of this workflow require the use of both an iPad and an Apple laptop, which is not ideal, but it’s the best quality workflow for simplified publishing that I’ve been able to figure out. 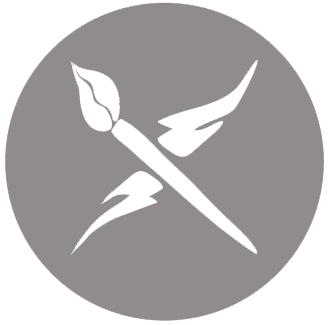 More resources about creating and sharing eBooks are available on the eBook page of ShowWithMedia.com. 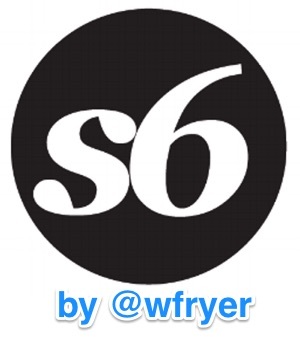 If you have feedback or questions about this workflow and these steps, please reach out to me on Twitter @wfryer, by using my electronic contact form, or with a comment below. 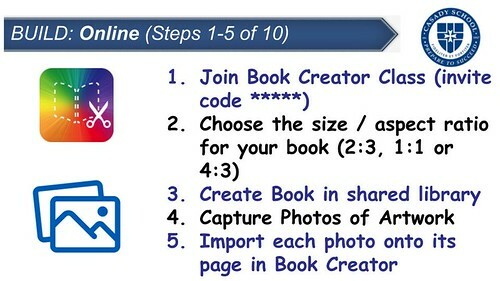 I LOVE helping students and teachers create books and eBooks with Book Creator! I’m hopefully going to share a repeated workshop for teachers at our school in March on “Creating Multimedia eBooks,” and will use that opportunity to further reflect on and share lessons learned from these student projects. If you’re interested in inviting me to your school or organization to share a workshop about ebook creation and publishing, please submit my speaking inquiry form. More information about my speaking topics and services are also available. I hope these resources empower you and your students to create books and eBooks to share your creativity and ideas with the world!